Imagine being a part of a six week hands-on internship that will challenge you mentally, physically and spiritually. Dirty Feet Missions invites young adults ages 17 and up to Para Servir [literally meaning “to serve”]. The summer of 2019 will begin as a blank canvas. You will spend time deeply immersed in the Guatemalan culture crafting a unique picture of what it looks like to serve others. During this time, we will work alongside Porch de Salomon building not only homes for the indigenous Mayan people, but relationships as well. In addition, the team will take a journey through the life of Jesus. Void of denominational doctrine you will learn what it means to serve humanity through unconditional love. DFM likes to work hard and play hard. 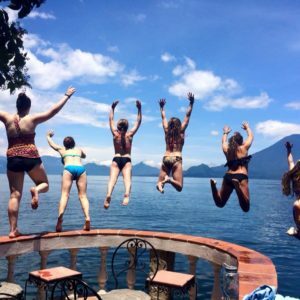 We will enjoy the natural beauty of Guatemala from one of the most beautiful lakes in the world, Lake Atitlan. We will explore the streets of Panajachel and squeeze in time to explore, kayak, hike and zipline. Through hands-on experience and teaching, your life will be transformed as we bring to life the picture of this man Jesus Christ to the Guatemalan people. Together we will make a difference! The deadline to apply is January 15th, 2019. Applicants will be accepted into the Para Servir Internship Program on a rolling basis so we encourage you to apply early! It is our goal to make Para Servir Internship as cost effective as possible. You are responsible for your own airfare to and from Guatemala as well as short term travel insurance. Catch up with our Para Servir interns from previous years and see where Para Servir has taken them!